On Sunday, September 28, 2014, Jordan Zimmermann threw the first no-hitter in Washington Nationals history. I was fortunate enough to be in attendance for the historic event, and I am excited to share my perspective of everything that happened. So much happened in fact, that I decided to split it up into two posts: one about the actual game and one about after the game. From there it was time to make our way to our seats. We walked around the stadium to Section 319 and took in the sights on what I mentioned was such a fantastic day; maybe an omen for the events which were about to transpire. 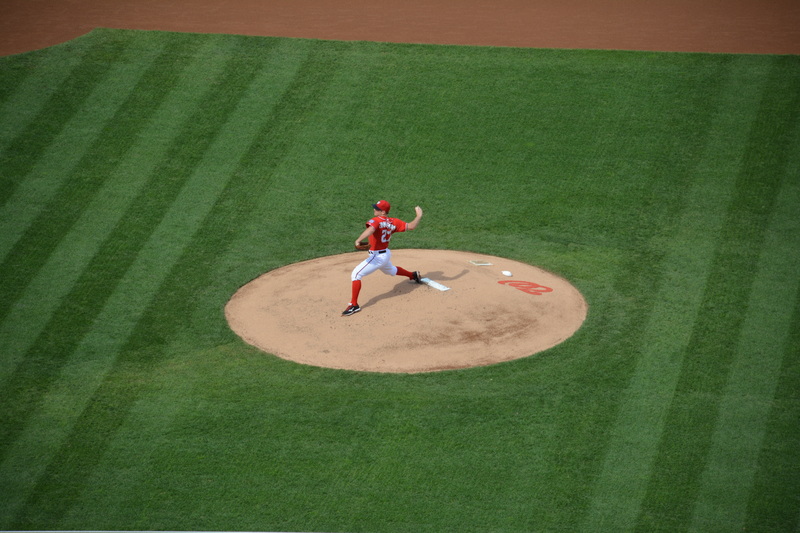 The Nationals were playing the Miami Marlins, and Jordan Zimmermann was being opposed by Henderson Alverez. As you may remember, Alverez tossed a no-hitter in last season’s concluding game. He took a no-hitter into the ninth inning, but the game was still scoreless. Then in the bottom of the ninth, the Marlins walked-off in what was one of the craziest endings to a no-hitter in the history of baseball. All my life, whenever I attend a baseball game, I go hoping to see a no-hitter. I constantly check the scoreboard until I see both teams have recorded a hit; it’s just one of my baseball-watching obsessions. So on Sunday, unlike Tyler Moore, who didn’t know a no-hitter was being thrown until the ninth inning, I was attentive to the fact of what was occurring before my eyes the entire game. The game started off quickly. Zimmermann recorded a 1-2-3 first inning and the Nats were also set down in order. However, when Ryan Zimmerman came to the plate in the first inning, the crowd sang Happy Birthday to him, as he had just reached 30 years old. In the second, it was six up six down for JZ, who just kept on rolling. Then in the bottom half of the inning, Nationals shortstop Ian Desmond launched his 24th home run of the year and that gave the Nats a 1-0 lead. The Marlins could not muster a baserunner in the third inning either. When the Nationals got up, it was time for the crowd to begin acknowledging the hard work the starters had put in all season long. After Denard Span doubled, he was replaced by Nate Schierholtz, and he received a standing ovation as he walked into the dugout. The same happened in the bottom of the 4th, when Adam LaRoche and Bryce Harper were replaced by Tyler Moore and Scott Hairston, respectively. Zimmermann’s perfect game was intact until the fifth inning. Chantilly High School’s own Justin Bour drew a two-out walk to give the Marlins their first man on base of the day. I was slightly disappointed the perfect game was gone, but I could tell how well JZ was pitching and I knew there was a strong possibility I could still witness history. The game continued on and the tension continued to build. While no more runs were scored, the excitement grew as each out was recorded. I have never been to a baseball game before where the whole stadium was so into every pitch; it was an atmosphere I will not forget for a long time. In the top of the seventh, Miami was able to put a second person on base. Garrett Jones struck out, but the ball bounced away from Wilson Ramos, and Jones was able to make it to first on the dropped third strike. I was glad he was not the only baserunner for the Marlins. If their only runner had been on a dropped third strike, that would have been quite disappointing. Ramos made up for not blocking the pitch though, by picking Jones off of first base. The crowd erupted as the umpire signaled him out, and just like that, Zimmerman was six outs away. The Nationals did not score in the bottom of the seventh or the bottom of the eighth, so the game went into the top of the ninth with the Nats still ahead 1-0. Stephen Souza Jr. was inserted into left field as a defensive replacement. Jordan Zimmermann needed only three outs to secure his place in Nationals lore. The crowd was on their feet, cameras were recording, and I stayed nervous. The first two outs were recorded quickly. Then the magic happened. Christian Yelich stepped to the plate as the last chance for the Marlins to avoid being no-hit. On a 2-1 count, he drove a ball to deep left field. The crowd held its breath and Zimmermann threw his head back as he was sure the ball would drop for a double. All of a sudden, out of nowhere, the aforementioned Souza came flying in and made a spectacular diving catch to save the day. Bedlum ensued as the players stormed the field. 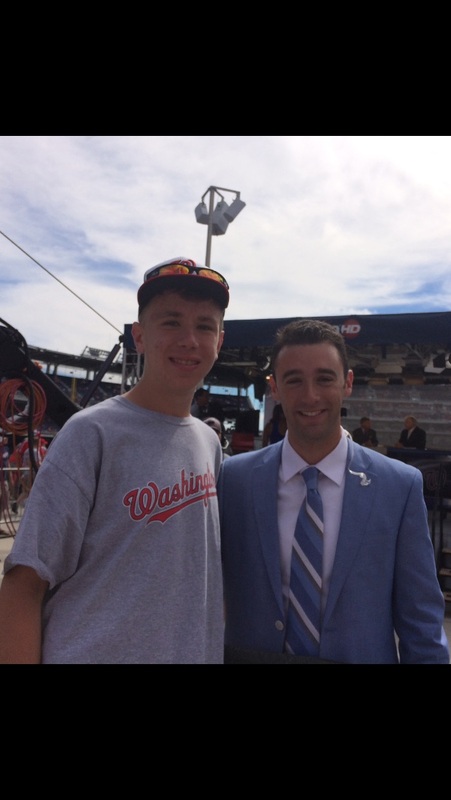 After the celebration, it was time for Zimmermann to be interviewed by none other than MASN Dan. Zimmermann was showered in Gatorade, bubble gum, and even an equipment bag as well as a rosin bag. Jayson Werth did the honors of throwing the pie in Zimmermann’s face and Werth took no mercy on Kolko either, pieing him as well. You can see my first hand account of all these events in the YouTube video below. It covers the entire ninth inning as well as the on-field post-game events. Great day for baseball and for you to watch Jordan pitch the 1st no hitter, Paul. I like this run down from you on the events as they unfolded. Enter your email address to follow my blog! I promise there will be no junk emails, just an email when I post.